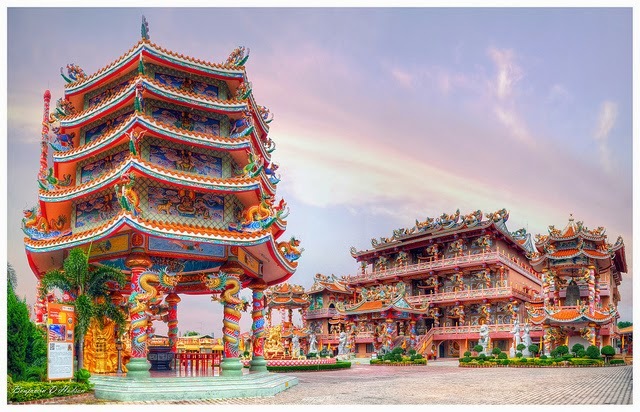 Najasaataichue Chinese Temple is located on the coastal fringe of Chonburi City, Chonburi Province, Thailand. It is believed to be the largest Chinese temple of its style and architecture in Thailand. Dedicated to the God of Success, Najasaataichue temple underwent renovations between 1995 and 1999 as part of Rama, the King of Thailand's 72nd Birthday Anniversary, when its name was officially changed to "Thep Sathat Phra Kiti Chaloem." Like most locations I visit and photograph in Thailand there is very little translated information to help. Although the temple is commonly referred to as Najasaataichue Chinese Temple, it is better referred to, and searched for under the name "Thep Sathat Phra Kiti Chaloem". The temple is located in the town of Angsila on the coastal road of Angsila-Bangsaen close to the beach resort of Bang Saen. It is built on foundations laid down by Somchai Choesiri, while gaining popularity and expanding to its current form. The temple architecture is common to this style of Thai-Chinese temple. There are predominantly two forms of Buddhist temple found in this region of Thailand, classic Thai of the Theravada school and Chinese Buddhist. Both types of temples offer differing architectural and decorative styles. Questions? If you have any further questions about this article, tours to Najasaataichue temple or would like to purchace some of the artwork contained in this article, please feel free to contact me using the details provided.